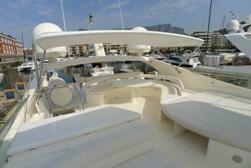 Sherilyn 76ft Luxury Motor Yacht. Mooring: V & A Marina, Cape Town. 20 buffet, finger snacks, platters. 2 X 1420hp inboard engines. 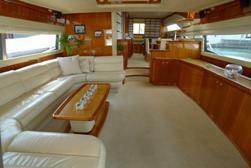 Sherilyn is a 76ft ultra-luxurious Italian built Ferretti Motor Yacht appointed in the lifestyle of the rich and famous. Designed for speed and comfort propelling you along at 37 knots with the minimum of roll due to the exclusive Ferretti anti-rolling gyros. Her interior is designed to the highest standards, with walls clad in cream nappa leather, her furniture is a combination of polished wood and cream leather. SHERILYN PRIVATE BOAT CHARTER RATES. Buffet, finger snacks, canape and platter meals are additional. Sit-down meals (8 interior dinning) (6 on Aft deck) (6 on Fly Bridge) - Rates and menus on request. Meal are additional. NO BARBEQUE (BRAAI) FACILITIES AVAILABLE. Special occasions and staff functions. 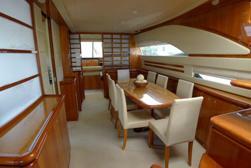 The aft deck of the Sherilyn is the ideal area to dine alfresco and enjoy the delights from the galley. 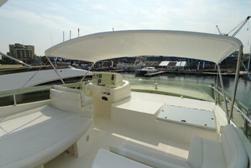 The fly bridge is the perfect place to enjoy sunset cocktails and all day fun relaxing on the sunbeds. There is a well appointed dinning area and separate saloon area. 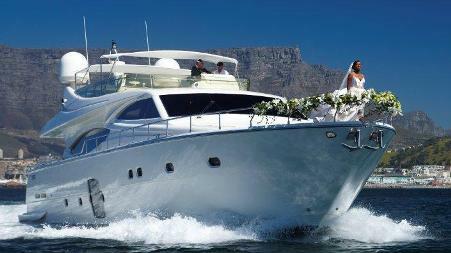 Hout Bay scenic cruise and/or step ashore restaurant cruise.